Since the early 1970s, Rebecca Holder has been a patient at Baylor St. Luke’s Medical Center. She was born with a congenital heart defect, but that didn’t stop her from living her life the best she could. Born with multiple congenital heart defects, she had a hole that separated the top two chambers of her heart, an abnormal heartbeat, reversed pulmonary and aortic arteries, and restricted blood flow to her lungs. She also had low oxygen levels, which caused her lips and fingernails to turn blue. Because of her complicated conditions, she was not a candidate for surgery. Rebecca wasn’t expected to live past her first year of life, yet continued to live. At school, she was restricted from physical activities due to feeling fatigued from lack of oxygen. Yet, Rebecca continued going to school, got married and had a son, even though she wasn’t expected to have any children because of her health. 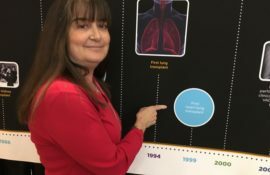 But by 1990, she developed a bad cough and was diagnosed with pulmonary hypertension, high blood pressure in the arteries that lead from the heart to the lungs, which forced her heart to work harder to pump blood in her body. The cough got worse over the next nine years, so much that she couldn’t take care of herself anymore. Eventually Rebecca became so short of breath and weak from the lack of oxygen, she realized she wasn’t getting better. “We were praying for a miracle,” she said. To live, she would need a new heart and new set of lungs. In January 1999, Baylor St. Luke’s placed her on the transplant list, and she received the transplant that October. 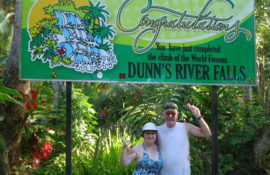 Rebecca was Baylor St. Luke’s first successful heart-double lung transplant patient. Since her transplants, she has been able enjoy life so much better—especially those simple things most people take for granted. Rebecca also volunteers with the Baylor St. Luke’s Heart Exchange support group and provides emotional support for transplant patients. 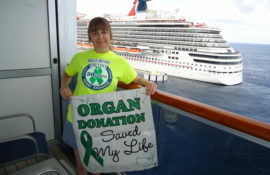 Rebecca realizes how blessed she is to have received the gift of life, and wants to give back. She also honors the donor family by taking care of herself and following the protocol. As she reflects back on the majority of her life as a patient at Baylor St. Luke’s, the hospital has become her second home.